It’s that time of year! For the second time, Sanibel and the rest of the country will celebrate National Sea Shell Day on June 21, 2017. Whether you’re on the island or far away, National Sea Shell Day is a great time to reflect on our beautiful island paradise and all of the treasures she holds. Begin the day, which also just so happens to be the first day of summer, on the sand with us, or by tuning into nationally-broadcasted television program, Good Morning America. As one of the sea shell capitals of the world, Sanibel Island is the headquarters for this very special day. Expect to encounter National Sea Shell Day related activities all over the island. Join one of many shelling groups or professional charters, or take off on your own for a one-on-one experience with our beautiful shells. One thing is for sure, there are plenty to go around! After you’ve shelled to your heart’s desire, head on over to the National Shell Museum and explore every aspect of the shelling world, from shell formation to beautiful “Sailor’s valentines.” The Bailey-Matthews National Shell Museum is the only museum in the United States that is solely devoted to shells and the mollusks that make them—again, where better to spend National Sea Shell day! 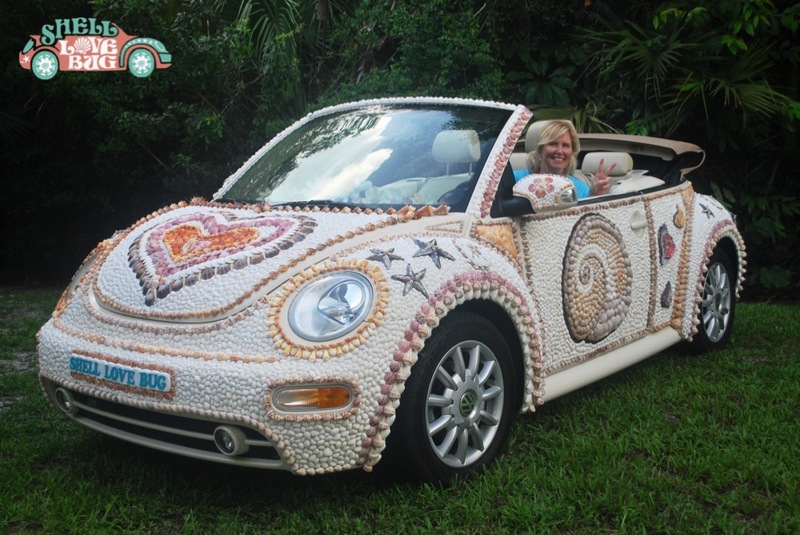 Keep an eye out for the shell love bug, a VW beetle adorned with thousands of shells, all hand glued on to the vehicle. You won’t want to forget to bring a camera for this one—it’s one of the area’s best photo ops! After a fun-filled day (and maybe a short nap), hit the sand at sunset for one last opportunity to practice your best “Sanibel stoop” before the sun sets for one more year on National Sea Shell Day. Keep an eye out for the lightning whelk, rose murex, Atlantic giant cockle and potentially… a Junonia! Now that would be a storybook ending. Can’t join us on the island for this special day? The good news is that we like to think that every day on Sanibel Island is national seashell day. Any time of the year, thousands of sea shells are scattered across our sands every single day, waiting for you to pick them up and celebrate. Looking for events on Sanibel during April? Look no further, you’re in luck! For the third year, the Clinic for the Rehabilitation of Wildlife (CROW) will host members and supporters at the newly-renovated Sanibel Community House for one of Sanibel Island’s most popular fundraisers Southern Comfort. Join locals and visitors for dinner, dancing and fun before saying goodbye for the summer. The best part? All the money raised will go directly to the clinic to further care for sick, injured and orphaned animals of Southwest Florida. Southern Comfort is truly a community affair that allows all our island businesses to participate! This year, an assortment of comfort food will be provided by the mouthwatering eatery The Pecking Order and Island Ballroom will provide the music. In addition to the food and music, there is more fun than ever offered at the 2017 fundraising event. Carnival style games like darts, basketball, a putting green and a wine bottle ring toss will provide guests with the opportunity to earn tickets that can be redeemed for silly to nice prizes. This year, the event will feature its first-ever live auction and raffle. Attendees will enjoy the chance to score a meal for eight from Resident Chef Jarred Harris in the winner’s home. Plus, a personal movie viewing at Island Cinema for 40 of the winner’s family, friends and coworkers, drinks and popcorn included! Raffle winners will receive one of eight prizes including jewelry from Congress Jewelers, a CROW wildlife walk and a gift certificate to Norman Love Chocolates. The 3rd annual Southern Comfort on Sanibel event will be held Saturday, April 1. The doors open at 6 p.m. and the last dance ends at 9 p.m., at the Sanibel Community House, 2173 Periwinkle Way. Tickets are $55 per person before March 22. The price increases to $65 a person thereafter. Those interested can purchase tickets at http://www.crowclinic.org/, or at the door the day of the event. The Clinic for the Rehabilitation of Wildlife is a teaching hospital and visitor education center dedicated to saving wildlife through state-of-the-art veterinary care, research, education and conservation medicine. Each year, CROW cares for approximately 3,500 wildlife patients including more than 200 species of sick, injured and orphaned wildlife in its veterinary hospital, which is one of the nation’s leading rehabilitation facilities for native and migratory wildlife. If you will be visiting sometime in 2017, you will have access to the newly renovated Sanibel Community Center, our island’s legendary hub of social activities for both locals and visitors. After just 9 months and a $3 million dollar budget, the historic building has undergone a massive reconstruction, restoration, renovation and expansion project. Since 1927, the Community House has held its own personality and identity on the island an important feature of life in the Sanibel Island community. Check out what the building looked like in the 1920s! Restoration included: Restoration of the historic North Room, now called the Founder’s Room, the addition of Old Florida features outside like a new roof and porch style entryway/drop off area. The interior was redesigned for a more open, flexible floor plan and the existing kitchen and restrooms were made larger and now feature modern fixtures and equipment. Many of the building’s historic features, if not completely preserved were repurposed. Twin fireplaces in the new Founders Room have been decorated with mantles constructed of repurposed wood from the room’s original floor. Windows of this room are home to open display cases that will be filled with shell crafts, awards and other artifacts from The Community House’s past. So far, the reviews from the public are positive. Tour the newly renovated Community House at the upcoming 80th Sanibel Shell Fair, taking place on March 2, 3, 4, 2017. For a full list of events and activates held at the Sanibel community house, visit their website at www.sanibelcommunityhouse.net. At Signal Inn, we love providing pet friendly rentals on Sanibel. Your special time away from home should be as stress-free as possible and for many, that means bringing your pet along with you on your beach vacation rather than finding a sitter or placing them in a kennel. We aim to make your pet-friendly vacation as simple as possible, which is why this month, we want to highlight a few tips regarding traveling with your pets. During travel, pets can become stressed or anxious—continue reading for a few tips to make your animal’s’ transition into island life as smooth as can be. It never hurts to get your fur baby a check up before heading to the island. Beyond ensuring your pet’s health, it’s the only way to get a bona fide health certificate. That certificate — and proof of an updated rabies vaccine — may be necessary during your stay. The check up will help you avoid potential issues that may arise during your stay. Check out the status of your pet’s collar before you leave—the last thing you want is to leave you pet with absolutely no identification in the case of an emergency. Also, bring a photo of your pet with you just in case you need this to assist in locating your pet. Make your pet feel at home; be sure to bring their favorite food, toys blankets, bed and more! Pack a bowl for their water, treats, a first-aid kit, medications (both oral and topical), and a copy of their medical records. Most importantly, bring your pet’s own food. Trust us; this is not the time to get experimental with your pet’s digestive tract. If you follow our tips, you’re trip is sure to run smoothly for you and your furry friends! If you have any other pet-related questions, please give us a ring at (239) 472-4690, we’re always more than happy to assist! To Janeth from Cape Cod, Happy 100th birthday! To Arlene and Duane from Illinois and precious Molly, sending good thoughts. To Marshall and Susan, so sorry for loss of Sweetpea and Minnie, but so happy about your rescue of sweet little Winnie. We have a picture in the office on the wall Thank you. To all of our returning guests welcome and thank you for making The Signal Inn the wonderful place it is. To our guests in November of 2016, thank you for saving the male dolphin that was beached on our shores. We have heard he is doing well at Sea World. You people were amazing. Last year my husband Chuck and my best friend Gerry both Retired. I miss working with them. We welcome our new employees Donna and Betsey. I know you will enjoy meeting and working with them. Chris is working hard to keep the grounds looking beautiful and your visits as great as possible. PS… Sam is still working hard too! The Sanibel Library: A Refuge Inside A Refuge! This is the headline at the Sanibel Library. Unlike many libraries in our area, the Sanibel Library is not part of the Lee County Library System and is run on the island by islanders. If you love Sanibel Island, you will LOVE this library– it truly is an experience crafted by others who love the island, just like you! Our library is not just a repository for books, but a hub of activity for both residents and visitors alike. No need to pack a bag full of your vacation reading, drop by the conveniently located Library location to take a cool break from the beach to browse island reading, check out their calendar of activities, some of which you might find quite interesting. The library is hosting some well known authors in January, one of which might be one of your personal favorites such as Margaret Atwood, Debbie Maccomber or B.A. Shapiro. Books, music, magazines and movies are all available to you as a visitor. You can easily register online for a Sanibel Library card as a visitor for only $10 for the entire year. Ebooks are also available and super convenient for the traveler. The children’s room is really something special and a safe place for your kids to cool down and find something to amuse themselves during the down times of your vacation. The Teen Space is designed by Teens for Teens. Houses a collection of Young Adult books, graphic novels and magazines. A great space to relax, read or talk and make new island friends. All in all the Sanibel Library is a great place to stop by and pick up some vacation reading, catch up on your favorite magazines and news and also a great rainy day activity! We’re so excited for the holidays here at Signal Inn and hope that you and your fur babies will be joining us for all the festivities, the dazzling holiday lights and joy of the season– we are pet friendly after all! After you are settled in your comfortably appointed suite, please plan to join us as we welcome in the spirit of the holidays with these family-friendly events. The season starts with A Walk Through Bethlehem . As you step into this living production, you’ll step back in time to understand and experience the calamity in the days leading up to the birth of our Messiah. Performances are Wednesday, November 30th; 7-8 pm and Friday, December 2nd; 5:30-9 pm. Located in the Historic Chapel at Sanibel Community Church, 1740 Periwinkle Way (next to Jerry’s). Free to attend. The 32nd Annual Luminary Holiday Festival takes place December 2 – 3, 2016. This event tops the list for locals and visitors alike as the luminaries light the path from one end of our glorious island to the other. You’ll enjoy shopping, music, food and activities for the entire family. Santa visits with everyone as the holidays sparkle to life. The Holly & Ivy Bazaar takes place December 2, 2016, allowing the chance to pick up some homemade island goodies to carry home for stocking stuffers and lend support to the local missions ministry. For those joining us for Christmas, you can enjoy some quality time with Santa before he heads out for the big night. Join him on Santa’s Dolphin & Wildlife Cruise to Picnic Island for a day of fun in the sun! If an evening on the water better suits you, join us for our unique Christmas Eve Sunset Dolphin & Wildlife Cruise where we’ll enjoy eggnog and cookies while listening to tropical tunes and watching frolicking dolphins in the San Carlos Bay. All area houses of worship welcome visitors anytime. If you are looking for Christmas Eve or Christmas Day services there are many to choose from. A revered annual service that draws believers of all faiths is the Christmas Eve service on Lighthouse Beach. We are thrilled to announce that Signal Inn has received the distinguished White Glove Award! The White Glove Award was created to distinguish hotels and resorts whose housekeeping standards are rated beyond exceptional by the Superior Small Lodging Association (an association for boutique hotels). The Florida Superior Small Lodging Association (SSLA) recently announced 14 Lee County hoteliers have successfully qualified for the distinguished SSLA designation. The SSLA certification is a statewide hospitality recognition program. In addition, 10 of the 14 total SSL properties inspected by the Property Review Program (PRP) qualified to receive the coveted Donal A. Dermody White Glove Award for best practices in housekeeping. Properties must receive a score of 100 percent for all components of the housekeeping inspection to be eligible to receive the White Glove Award. All 125 statewide members of SSL automatically become members of the Florida Restaurant & Lodging Association (FRLA). Additionally, members with restaurants also become members of the National Restaurant Association (NRA). Superior Small Lodging Program Eligibility for participation in the Lee County SSL program is restricted to accommodations with 75 room units or less. Properties must hold a valid hotel, motel, inn or bed and breakfast license and pay all applicable state and local taxes related to the operations of an accommodation. The SSLA inspection program and designation is designed to provide travelers with an easily identifiable symbol to demonstrate that the accommodation is clean, safe and a well managed small lodging. The passing grade for an unexpected inspection in the program is 82 percent and is based on a comprehensive review of six different property attributes: registration/operations/public places, guest accommodations, bathrooms, bathroom supplies, kitchens, and property exterior. Take a peek at our Tripadvisor reviews and you’ll see that our guests agree with the SSLA! Have you stayed with us before? Leave us a review and let us know what you thought! We are absolutely thrilled to receive this award again and we look forward to continuing the great service our guests know and love for years to come! If you’ve done any kind of reading or research about Sanibel Island you will know that, one, we are known for our shells and two, you should always be on the look out for our most rare and popular shell, the elusive Junonia. So what is this unique shell? The technical name is Scaphella junonia and while alive, the beautiful speckled shell is in fact a home for animals such as large sea snail or marine gastropod mollusk. This creature usually lives quite deep in the waters and only washes up after a strong storm or hurricane. The name comes from the Roman goddess Juno, who was known for her stately beauty. They can reach lengths of 4 to 6 inches so you can collect many different sizes depending on the development. With it’s cream colored shell containing 12 spiral rows of brownish squares you will find it quite easily if it’s there. A very striking shell! Consider yourself very lucky if you find one… sometimes islanders go months until another another one is found. If you are blessed with enough luck to locate a Junonia shell on the shores of Sanibel, you will have a very rare shell to add to your collection and bragging rights for years to come. You can even get your photo taken and placed in the local island paper! You may ask yourself, why are Junonias so popular on Sanibel? Because of Sanibel’s East-West orientation, which is quite different from most other barrier islands that run from North to South, Sanibel is host to millions and millions of shells collected on our shores. Currents from the Caribbean also bring shells into our area and the warm Gulf waters allow for these delicate creatures to thrive and procreate. Not only is the sheer number of shells on our beaches phenomenal, but the variety of shells available for picking is mindblowing! Horse conchs, calico scallops, banded tulips, starfish, corkscrew-shaped augers, sand dollars, the rare lion’s paw and more can all be found along our coast.